By making structure research more causal and studying evolution with the aim of developing an Evolutionary symmetry theory (Hahn 1989, 1990, 1994, 1996, 1998) criteria can be set up explaining how constructive innovations in nature develop. It's a matter of founding a functionally oriented, dynamic bifurcation morphology as a method of a new development theory with empirical content. This method tries to describe all forms (animate and inanimate) in an evolutionary way. I have discussed symmetry and asymmetry as basics of development involving processes ("rules", "principles") which, affecting space and time, make possible, give reasons for, determine and structure a dependant object (Großmann 1990) . The path from an empirically supported "dynamic morphology" of art with evolutionary elements led me to nature and culture with fruitful starting points for an extensive evolution theory: neo-evolutionism. In this way the STYLE of ars evolutoria (evolutionism), including its diverse variations and its objectifying of the evolutionary art theory to a new art and nature theory, was founded. On the basis of ars evolutoria I developed the mental structure of neo-renaissance and neo-modern art (ultra-modern art, trans-modern art); later also called science art (art science). Science art revived the unity of nature and science with art, lost after the Renaissance, in accordance with the Renaissance maxim "Ars sine scientia nihil est" ("Art without a scientific basis is nothing"). I set the aesthetic postulate of L'Art-pour-la-science ("Art for science/cognition") against the dogma about the self-purpose of art (L'Art-pour-l'art). The dynamic evolutionary bifurcation morphology I delineated is object bound. Fulguration (creative "fluctuation") does not develop abstractly in airless space (i.e. not as "creatio ex nihilo"). Instead, evolution is portrayed as a system-optimising process, as a functional trial and error method on the basis of inner form laws. Continued repetitions of a construction rule (mathematicians call this "iteration") lead to self-similarities in my evolutionary geometry. Form change is caused by evolutionary iterations. Through numerous examples and in several figures (in the book on symmetry; Hahn 1989/1995 and 1998) I could prove that the new evolution theorem discovered using science art can be carried over by analogy onto the form evolution of inorganic and organic systems. Although in symmetrization symmetry can also be seen as a "similarity of parts as an expression of a whole" (Rudolf Wille), a symmetrization goes beyond this, being a dynamic process causing new self-similarities. In this process the parts of a potentially alterable totality of events are transported through a bifurcation (a fork in the path; branching, bridge or jumping points) not only into "old" parts identical in structure and function, but also into "new" parts with altered structures and functions. This development of an identity-anulling evolutionary innovation (aniso-symmetrization) through symmetry and asymmetry breaking that occurs with symmetrization must, as such, be interpreted as an asymmetry process. Every creative symmetrization interactively contains an asymmetrical aspect which negates total similarity (iso-symmetry). I have named this asymmetry course primary asymmetrization (initial, basis, or fundamental asymmetrization). The reciprocally effecting initial asymmetrization, dissimilar to symmetrization but with complementary polarity to it, fulguratively ensures that an ordered repetition of identical forms (identical system samples or elements) is avoided without resulting in destructive, chaotic structures (disorganization). 1) using an active, energy consuming (instable) imbalancing process (=asymmetrization), and 2) using a synchronous (stable) balancing process (=symmetrization). According to the Evolutionary Symmetry Theory as currently seen in the developmental conception of my Neo-Evolutionism, when form variety evolves in nature through creative evolutionary factors that gradually and/or suddenly (continuously/discontinuously) induce new quantitative and qualitative mutations, then mainly primary asymmetrization/symmetrization is active as a fundamental "opposing pair": A duo in "harmonious discord" or (seen symmetrisized) "discordious harmony", whereby the causes for the complementary encompassing, energy and matter transforming uniform system are not a mysterious, unrecognisable secret (see also my Ur-form theory / protoform theory); for futher details see Hahn 1989, 1990, 1994, 1996, 1998). Beauty is that which through asymmetrizations linked to symmetrizations has become symmetrical. In the unified concept of asymmetrization/symmetrization, asymmetry can be understood as an auto-evolutionary, energy exchanging or consuming impetus that creates novel forms, movements and functions (aniso-symmetry). As such, asymmetry is not an "enemy" of symmetry, is not "anti-symmetry", and does not exist without symmetry. Through experiments I was able to prove that for an emerging structure mutation in my art (ars evolutoria with the variations neo-cubism, pointillistic and expressionistic evolutionism, neo-barock/neo-mannerism) proportion altering transformations are, beside the architects primary asymmetrization/symmetrization, of secondary importance for evolutionary self-renewal. The transformation mechanism, which causes form distortion, can induce harmonic "deformation" of a structure by making forms partially dynamic, but the form alteration resulting from changes in the relative measure of coordinates and angles always contains an element of invariance. Seen from a fulgurative evolutionary point of view, few truly new things are "invented" in this way. Wentworth d'Arcy Thompson, who, in accordance with Albrecht Dürer's form experiments with the deformation of a coordinate system, described transformation metamorphosis as a "growth law" and hoped for a "dynamic morphology" to explain the "riddle of form", was well aware of this. Transformations can be interpreted as secondary asymmetrizations. It should be noted here that the old "modern" art, art theory and institutionalized art science have yet to say anything about evolution and little about symmetry. What was said is mostly difamatory. An interdisciplinarily oriented art science should finally take up the topics of evolution and symmetry as maxims, as well as accept and attempt to further "evolutionary aesthetics". Evolution-oriented aesthetics goes far beyond the field of art, presenting the evolved totality of reality, in which aesthetic values appear (daily aesthetics, natural aesthetics). Antithetic to modernistic-postmodernistic cultural conservatism and on the threshold of the new new age, I am trying, on the basis of universal, synthetic evolutionary aesthetics, to induce the turnabout in the new territory of natural aesthetic thought. Questions on the sense and value (truth) of beauty and art (once again) act as a constant, innovative impetus for philosophical nature and art aesthetics. Here the aesthetics of a Neo-New Age, which I also introduced art scientifically as neo-modern, ultra-modern, and trans-modern, encompass the study of nature and art (Goethe: Kunst als "zweiter Natur" = art as "second nature"). Anti-art or non-art ideologies, which arbitrarily dominate the present system of a totally negatively expanded/unbound field of art including the art market scene, must be a "thorn in the eye" for evolutionarily motivated, objective artist aesthetics (for example ars evolutoria), since forms of the evolutionary perception and understanding of art are relevent for natural aesthetics and primarily directed by the eye-brain system. the author has collected, he proposes that the new ars evolutoria can function as an example for the sciences. The book is divided into three distinct parts, each one focusing on a special issue. In Part I, the phenomenon of symmetry, including its discovery and meaning is reviewed. The author looks closely at how Vitruvius, Polyclitus, Democritus, Plato, Aristotle, Plotinus, Augustine, Alberti, Leonardo da Vinci and Durer viewed symmetry. This is followed by an explanation on how the concept of symmetry developed. The author further discusses symmetry as it appears in art and science, as well as in the modern age. Later, he expounds the view of symmetry as an evolutionary concept which can lead to a new unity of science. In Part II, he covers the points of contact between the form-developing process in nature and art. He deals with biological questions, in particular evolution. The collection of new and precise data on perception and knowledge with regard to the postulated reality of symmetry leads to further development of the evolutionary theory of symmetry in Part III. The author traces the enormous treasure of observations made in nature and culture back to a few underlying structural principles. He demonstrates symmetry as a far-reaching, leading, structuring, causal element of evolution, as the idea lying behind nature and culture. Numerous controllable reproducible double-mirror experiments on a new stereoscopic vision verify a symmetrization theory of perception. On the Problem of Organic Form Development: Can an Artist Approach the World and Its Content Only in a Metaphorical Way? Evolution: Fairy Tale, Theory or Fact? Can We Experience Evolution Directly? "...where nature ceases to bring forth new forms, man commences to create an infinite diversity of forms with the help of natural things, that is with the help of nature itself." "If nature were not so thoroughly stereometrically in its inanimate beginnings, how would it ever rise to unpredictable and immeasurable life?" Since 1970, using the methods of trial and error, supposition and refutation, I have attempted to establish formal results for my sculptural thinking and work on the foundation of nature observations. Using sculptural experiments with variable form-color pictorial signs, I arrived, via perception of movements and configurations, at a procedure for constructing forms exclusively by means of reflections ("symmetrizations") and distortions ("transformation", "asymmetrization"). These results were surprising, and attracted a great deal of attention (see the chapters 5. - 5.4.). A method for changing forms was discovered by means of sensory concepts (perception, experience) in two and three dimensions. This method allowed derived configurations to originate which resembled previous and intermediate forms, despite the variety of structural designations. I thus intuitively and spontaneously arrived at the following assumption (a provisional truth), which is of outstanding theoretical and practical usefulness: The symmetrical structures of spatial and temporal order in nature may reflect an important factor for evolutionary changes in nature. The hypothesis, deriving from the will to knowledge, that symmetrization and asymmetrization are the architects of evolution in the realm of natural events presented itself as downright compelling in view of quotidian understanding and especially biological background knowledge. Creative symmetrization can be defined as an evolutionary process which forms regulatorily derived, structurally new entities. Here, symmetrical and/or asymmetrical refraction leads to the emergence of newly structured and diffentiable mirror-image/polar equalities synthetically combined into a network. Here, compared with the old, disrupted symmetrical totality of events, the new form of symmetry can obtain a selectional advantage from the symmetrization (which is often linked with asymmetrization). Pictorial examples (Figs. 150 - 170; chapters 5.2. and 5.3.) illustrate how, as desired, form-related, not form-identical but derived forms can be developed from a two- and three-dimensionally structured original form (basal form) via intermediate forms (bridging forms). In the midline-orientated sensory constructions which unfold in the course of time, special, unique, and surprising things appear - spontaneously, conspicuously, and unexpectedly - through self-reflections. In order to examine whether the hypothesis that symmetrization and asymmetrization might prove to be true as a principle of formation and construction in nature, or whether it does not agree with reality, I began, parallel to practical sculptural work, an intensive study of the literature on problems of symmetry and evolution. After two manifestos, in 1971 (see 5.3.1.) and in 1972 (12.2.1. 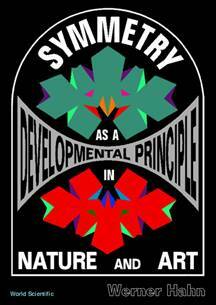 ), the first part of the book entitled On the Concept and Significance of Symmetry (chapters 1. - 5.4.) was completed by 1975. In it, the content and the role of the symmetry phenomenon was placed at the center of interest. A study of the literature revealed that hitherto there had not been any general evolutionary theory of symmetry. Thus the task was to conceive of the symmetry phenomeon directly as a heuristic principle which could serve to permit a number of new insights into the laws that govern nature and culture. My discovery of a new view of symmetry as a developmental principle produced in me an encyclopedic sense of joyous discovery. Looking above and beyond the boundaries of various disciplines, I was able to demonstrate that symmetry is a fascinating phenomenon which, consciously or unconsciously, provides perennial stimulation and challenge. I recognized that today, after a long pause, it has become possible to readapt art to the sciences, and vice versa, by means of an evolutionary concept of symmetry. In view of the artistic evidence I had collected on the reality of those form-creating master builders: symmetrization/asymmetrization - with whose aid the artist no longer works according to nature, but rather in the same manner as nature itself - we can state that the new art ars evolutoria (see below) can function as an example for the sciences. The obsoleteness of classical modernism, including its theory and philosophy of art, is also revealed by its inability to keep pace with the development of theories in the natural sciences, e.g. the scientific and cultural significance of the theory of evolution, doubtless the most important single theory in modern science. The "displaced ("ver-rückt") reference system of modern painting", in which "the concepts of the sensory world are no longer valid" (W. Haftmann), has hitherto not been able even to approximate the "unity of the world" (W. Heisenberg). The "displacements" of modernism have not been able to illuminate the "meaning of existence" for enlightened and scientifically educated 20th-century man (see 12.3.). In Part 1 of my book (completed in 1975), I concentrated on the phenomenon of symmetry, a phenomenon which could hardly be more manifold. Here, an object of knowledge was taken up which promised to overcome the fragmentation of science into individual disciplines, and of thinking and action into specializations that had become mutually unintelligible. Symmetry, if viewed as evolutionary instead of nondynamic, appeared to me as being the Ariadne's thread that can show us the way out of the labyrinthine realms of science, out of the old and the new unclearness of our world. The concepts of symmetrization/asymmetrization could indeed be a royal road leading to a new unity of science. Part 2 of my book: On the Problem of Organic Form Development (chapters 6. - 7.2.2. ), dealt particularly with biological questions. Here I discussed the points of contact between form-developing processes in nature and art that provide a theory of form, its development and its transformations. Emphasis was placed on the idea of symmetry at the beginnings of a dynamic, organic theory of form: Goethe, de Candolle, Darwin, and others (see 7.1. - 7.1.5.). Plant teratology proved to be a treasure trove for a posteriori symmetrizations and asymmetrizations that can be observed today (7.2.1.). It was ascertained that living nature behaves like an artist who does not permit himself to be restricted to the merely useful: The "mutation-selection theory" was surmounted (7.2. - 7.2.2.). The collection of new and increasingly precise data on perception and knowledge in regard to the postulated reality of symmetry then led to a further development of the "evolutionary theory of symmetry" (Evolutionary Symmetry Theory; EST) in Part 3 of my book: Evolutionism/Ars Evolutoria - Theory of Light/Color and Form, Morphogenesis, Morphomutability, and Morphoevolution as Causal Form Theory (chapters 8. - 13.). My purpose here was to present for discussion the facts and problems of an evolutionary concept of symmetry in its applicability to many fields of dead and living nature, to the liberal arts and natural sciences, and to society. It was my desire to stimulate a discussion of the Evolutionary Symmetry Theory that would transcend the boundaries of individual disciplines. The knowledge gained through the interaction of discoveries, new evidence (often experimental), and theoretical concepts was concentrated on the paramount importance of symmetry for understanding evolutionary events in nature and art. In many areas, this knowledge produced convincing arguments, e.g. the conviction that inter- and trans-disciplinarity in symmetry research leads to a recovery of scientific perceptional abilities which are hindered by individual disciplinary developments, by atomization into individual fields. Transdisciplinarity involves the development of an overarching paradigm encompassing a number of scholarly disciplines. The theory of symmetrization and asymmetrization as a theory of form, formation, and form-variation/mutation ("evolutionism", "neo-evolutionism") illustrates a transdisciplinary framework. The components of this theory (modern painting, art theory, evolutionary biology, natural philosophy, psychology, geometry, physics, chemistry, cosmology, music, etc.) are not only linked internally and closely interwoven through integration by the theme "symmetry"; in addition, the disciplines (monodisciplinary fields) are subsumed in the transdisciplinary concept "symmetry" under a supradisciplinary paradigm. Superintegration as the ideal of a unified science would be attained if all science could be reduced to a general theory of form. - Evolution of a form is unthinkable without total disdain for, and renunciation of, form. Dissolution of form in the sense of a transformation of totalities via symmetrization / asymmetrization is in the service of a morphoevolution (8.1. ff.). - Cell division in uni- and multi-cellular animal and plant organisms can be interpreted as mirror-image symmetrization. Likewise, in meiosis and DNA doubling I recognized symmetrizing formational processes. M. Eigen has postulated a mirror-image symmetry in the structure of the "Ur-gene"/"proto-gene" (10.3.5.4.). - The demonstration that changes of dimension and proportionality in ontogenesis and phylogenesis are primarily based on symmetrizations linked with asymmetrizations (10.3.4. ff.). - Light proves to be a causal factor in symmetroclastic and symmetrogenic morphogenesis and morphomutability (see Fucus serratus as an example; 10.3.4.6., 10.3.5.3., 10.5. f.). - The hypothesis of the inherently symmetrical and potentially bisexual "Ur-ur-ur...cell"/"proto-proto-proto...cell". Sexuality as a mechanism for triggering form-giving symmetrization (10.3.6. ff., 10.4.4.). Love as an act of symmetry (10.3.4.2.). - Model concepts on symmetrization. Evolution from unicellular to multicellular organisms via morphologically "primitive" diplocells, tetrad and octet forms (10.4. - 10.6.). - Demonstration that the master builders symmetrization/asymmetrization are the foundations for perception of objects and orders as well as discernment behavior, cultural evolution (11. ff.). - Discovery of double-mirror sight as binocular double stereoscopic vision that can be used to develop a symmetrization theory of perception via a plethora of controllable reproducible experiments with forms and colors (11.6. ff.). - Mirror-image symmetry as a law of form and composition, and the "principle of precision" in Gestalt psychology (11.6.5.). - Symmetrizations as the basis of all cogitation and memory (11.9.4.). - Experiments indicating that white visible light has a symmetrical structure (11.7.). - Refutation of the dogmatism of "absolute and blind chance" (J. Monod). Order in chaos (11.9.6.). - Ethicization via social symmetrization (11.9.7., 13.). - Evolutionism as the third basic direction in philosophy, being neither materialism nor idealism (12.2.3.). - Evolutionism as a unification of ambivalences: "great realism" - "great abstraction" (12.2.). - Symmetry as a developmental principle in music. Foundation of a musica evolutoria (12.5.). - The light-matter/antimatter-energy primary model ("Urform model") of evolution as a key figure in clarifying evolutionary processes, providing access to a "graphic atomic dynamics". Protomorphology and protomorphogeny which deny that the universe began from nothing, and postulate the dissolvable multiunity of the infinitely small in dynamic geometry: Ur-ur-ur/proto-proto-proto...symmetrization center, Ur-ur-ur/proto-proto-proto...geometry, Ur-ur-ur/proto-proto-proto...three-dimensionality, Ur-ur-ur/proto-proto-proto...mathematicity, etc. (12.6. and 12.7.). The results of my investigations thus overcome disciplinary limitations and embarrassments: The "dynamic concept of symmetry" and the method of interdisciplinary parallelizing makes it possible to attain an overarching pervasion of the "key theme: symmetry" in the fields of art, the humanities, and the natural and social sciences, a comprehensive integration and unification of the reality of art and the laws pertaining to it, together with the reality of nature and the laws governing it. This new direction in art: ars evolutoria or evolutionism, originally called "harmonic art" or "symmetrism", is, owing to its direct provision of experience, outstandingly suitable for making us aware of the fascination of symmetry as an evolutionary construction principle in nature and culture. Moreover, ars evolutoria is based on Goethe, who appraised art as a "true mediatrix", as the "most worthy interpretress" of natural reality (concept of style, see 11.8.). The art style evolutionism, which is directed towards the "unity of entirety", contains, as an integrative perspective, aspects of the following fundamental stylistic directions: realism (cogitation), surrealism (emotion), expressionism (sensibility), and constructivism (intuition) - all reflections of basic human psychosomatic structures - in an overall synthesis ("reanimation of modernism"; see 12.2.4., 12.4.). The style ars evolutoria, with the variants "neo-cubism", "neo-Baroque"/"neo-mannerism", as well as "atomism" ("pointillistic evolutionism"), provides a possibility for presenting and elucidating additional comprehensive connections that previously could not be expressed in art. On the one hand, I used the expressions ars evolutoria and evolutionism synonymously as stylistic concepts in this book, but in addition, in Part 3 I achieved an actualization and extension of the 19th-century term "evolutionism" in regard to a philosophy of nature and culture. In my pictorial work, and also in my book, the scientific attitude and the artistic vision are not antithetical. Since the search for unity in nature on an evolutionary basis requires transdisciplinary points of view and hypotheses in order to obtain knowledge of the symmetry/asymmetry phenomenon, and since there are many points of contact with the Renaissance, especially with the searchers and artists Leonardo da Vinci and Albrecht Dürer, the purpose of my book is to found a Neo-Renaissance as a "belligerent movement". This new concept for a new style and a new epoch: "Neo-Renaissance" as a constant challenge to cultural reflection, thus designates a new beginning for a comprehensive and evolutionary knowledge of the world obtained by a union between science and art. In view of the linking and interaction of the two, my book places critical emphasis on the art and cultural history of modernism: a plea for a positive, culture-forming attitude towards art. (On the dilemma of avant-gardism, together with its "kingmakers", see 11.9.9., 12.3., 13.). I hope to establish and encourage a dialog between institutions, disciplines, and persons involved in cultural activities of the present who so far have carefully avoided taking one another seriously. In addition, the book is intended to lead to a new understanding and consensus between competing world views, and between the cultural and natural sciences. On the basis of the universality of the form-creating and form-changing evolutionary factors: symmetrization/asymmetrization, and in agreement with the evolutionary epistemology, perspectives also emerge for a new and progressive philosophical direction, with the goal of "social symmetrization", i.e. ethicization by means of growing knowledge (11.9., 11.9.7., 13.). The Neo-Renaissance is convinced that man and society are capable of further education and development in the direction of perfection. It advocates the surmounting of the "fragmentation of our world view" (R. Riedl) by building a bridge between nature and mind. Thus it is important "to have unrolled the phenomena of symmetries in their full breadth to a monumental work; whether in quanta, atoms, and crystals, or in corporeal forms, senses, and brains, or in the forms of all the artifacts that have originated from human activity. Only then will we become aware of our potentialities: the concert of relations that joins the inorganic and the organic, our sensibilities, our thoughts, and our deeds; that which reciprocally unites nature and culture in the human psyche." (Riedl; see the preface of the book). In the hope that artistic creation and theoretical reflection in the new movement Neo-Renaissance (science art, neo-modern art; see chapter 13) will not be understood by only a few, the present book, despite the unusual multiplicity of aspects and projects contained in it, is intended as an introduction to this new material for the interested layman. In spite of all the documentary evidence that it presents, the book is possibly too short in places. However, a presentation of all the data would have made the book even more voluminous, and thus less appealing to the large circle of readers it was written for. In publishing these practical and theoretical research results, I hope not only to motivate the knowledgeable reader to recognize new tasks, but also to invite him to make suggestions for improvements in, and further developments of, the material presented here. My book on symmetry, which has been called "giant opus" (Sitte), "monumental work" (Irrgang), "opus magnum" (Der Spiegel) and "masterpiece" (Nagy) ("in the footsteps of Leonardo", according to Ohff, Der Tagesspiegel , Berlin ), has meanwhile been recognized as the key work on an Evolutionary Symmetry Theory (EST). In 1991, inspired by an excellent book review (Großmann 1990), I started the "Action/Initiative EST", which in 1993 resulted in the successful "International Frankfurt Symposium Evolutionary Symmetry Theory -Self Organization and Dynamic Systems" (Hahn/Weibel 1996; see as well Gutmann 1996, Wuketits 1996). asymmetrization/symmetrization principle (hypothesis, reciprocal mechanism), social asymmetrization/symmetrization (asymmetrizing initiative and resymmetrization), iso- and aniso-symmetrization, initial or primary asymmetrization, secondary asymmetrization (transformation), science art (neo-modern art/trans-modern art/ultra-modern art), auto-evolution, self-organization, evolutionary aesthetics, evolutionary geometry (bifurcation morphology), evolutionary humanism, neo-evolutionism, holo-evolutionism, holistic natural theory, universal theory of evolution, ethical universalism. "(...) we have to do with a marvellous compilation, an encyclopedia full of life, full of inspiration, full of ideas, full of references, associations, relations. I feel unreserved admiration for this gigantic, lovingly compiled and splendidly got up work. Congratulations to you on the completion of the work and its richness of content. As far as my knowledge goes, there is no other work that could stand up to comparison." "During 20 years of compilation, Hahn succeeded in creating an admirable book in which he traces the enormous treasure of observations made in nature and culture back to a few underlying structural principles. (...) The content is not merely contemplative, not mere curious observation, but the demonstration of a comprehensive hypothesis, devised as the result of experimental and theoretical research: symmetry as a far-reaching, leading, structuring, causal element of evolution, as the idea lying behind nature and culture. (...) The book is full of suspense and worth-while reading: symmetry as Ariadne's thread through nature and art as 'cause, source and driving force of evolutionary dynamics'. (...) Interdisciplinarity and general course of studies at their best. Literature as a link between science and art. Strongly recommendable." I extend my gratitude to all those who supported me with advice, interest and goodwill during the many years of my research. I am particularly grateful to Professors Werner Hofmann, Rupert Riedl, István Hargittai, Dénes Nagy, Hermann Haken and Arne Wunderlin, Friedrich Wilhelm Gutmann and Peter Weibel, Rudolf Wille as well as to Dr. Franz M. Wuketits for their support and interest in my works. Cordial thanks to (university) professor Dr. Rupert Riedl, chairman of the department of zoology at the University of Vienna, for his introductory remarks to the world of symmetries; a "very readable, genuine introduction" (according to Peter Sitte in a review). Moreover I should like to thank the publishing house World Scientific Publishing Co Pte Ltd, Singapore, for their assistance in publishing the extended English edition of my book on symmetry, which will be distributed worldwide. The book provides a sound basis for further reflexion at different levels and in various disciplines of the natural sciences as well as the cultural sciences. It would be a great pleasure to me to see this work continued - now on a global scale. 2.1.1. Vitruvius´ "Law of Symmetry"
2.3.1. Alberti´s "Concinnitas" and Leonardo´s "Divine Proportions"
2.3.2. Dürer: Simmetria - "Comparability ..., that is Beautiful"
3.3.3. Adorno: Asymmetry in Relation to Symmetry - "Non-Identical Objects" under the "Spell of Universal Identity" as the "Reconciled"
4.1. On the Question of the Development of Symmetries in Nature - Portmann: "Unknown Powers of Creation"
6. Can an Artist Approach the World and its Content only in a Metaphorical Way? 6.1. Are there Points of Contact between Different Formation Processes in Nature and Art which Make a Theory of Form, Formation and Form Change Possible? 6.1.1. Goethe´s Attempt to Consistently Invent Creatures "into Infinity" that have an "Inner Truth and Necessity"
7. Evolution: Fairy-Tale, Theory or Fact? Can we Experience Evolution Directly? 7.1.2. De Candolle´s Search for "True Symmetry" in Plants and the Problem of "Varieties" that "Are Passed On"
7.1.4. Portmann´s Legacy as a Morphology Scientist. How do Colours and Patterns without Adaptation Value Originate? 7.2. Ludwig´s Thesis: "Symmetry is a Marking of the Body just like any other" - Antithesis: Symmetrizations as Powerful "Active Guides"; Overcoming the "Theory of Mutation and Selection"
8.1.1. Leonardo: "Through Confusing and Uncertain Things Intellect is Inspired to Make New Inventions"
8.1.1.1. Evolutionary Action of Form in Symmetrism/Evolutionism - Naturally Regular and not "Confusing"
8.1.2. On Klee´s Claim that there is a "Form as Genesis"
8.1.3. Cézanne: Art as "Harmony Parallel to Nature". Can Colour-Forms "Modulate" themselves as Noumena and such like allegedly "Everything in Nature Models itself ... as Sphere, Cone and Cylinder"? 9.1.2. Can the Variety of the Animate and Inanimate World be Traced Back to Electrons, Positrons, Nucleic Protons and Nucleic Neutrons? 10.3.1. Are the "Architectural" Characteristics of Organisms Based on the Harmony of the Light-Matter/Antimatter-Energy-Prototype? 10.3.4.2. Love as an Act of Symmetry? 10.3.4.5. Theory of Mutation and Theory of Symmetrization. Production of New DNA by Repetitive DNA through Symmetrization Processes? 10.3.6.1. Omnipotent Cells as Symmetric and Sexual Structures (Male- Female Structure, Hermaphrodite Structure). 10.3.9. On Asymmetries in the Animal Kingdom as well as on Mirror-Image Right-Handed and Left-Handed Forms. Ludwig: "Bilateral Tendency" - Weyl: "Automorphism"
10.3.9.1. A-Posteriori Asymmetries in the Vegetable Kingdom. On Laevorotatory and Dextrorotatory Screw-like Structures, Enantiomorphic Development of Blossoms, Limited Divergence and the "Golden Section"
10.4.4. Homology of the Bipotential of Dipolar Symmetrization and Bisexuality? 11.8. Art as the "True Conveyer", the "Most Worthy Interpretress" of the Reality of Nature (Goethe: Stil [Style] ). Does the Knowledge of an A Priori of Stereometrical "Protoforms" Exist? 11.8.1. Cézanne´s Artistic Intentions and A Priori Idea of Being in Comparison to Ars Evolutoria and "Natura Naturans"
12.2. Interpretations of Legitimacy in the Ars Evolutoria. Evolution as the Unification of the Ambivalent Elements: "Superrealism" - "Superabstraction"
12.2.3.1. Goethe´s Concept of Levels in Symmetry as Metamorphosis-Idea. Polarity and Enhancement as the "Driving Wheels of Everything in Nature" - "Matter Never without Mind...Mind Never without Matter"
12.4. "Trasmutazione di Forme" of the Researcher/Artist Leonardo and Dürer. On the Unity of Artists and Researchers in Renaissance and Neo-Renaissance. Ars Evolutoria as "Neo-Baroque"/"Neo- Mannerism"
12.7. Consequences of the Theory of Protoform in Natural and Artistic Philosophy. Ars Evolutoria-"Atomism"